Lab created newborn diamonds, also known as engineered or cultured diamonds, are grown in highly controlled laboratory environments using advanced technological processes that duplicate the conditions under which diamonds naturally develop when they form in the mantle, beneath the Earth’s crust. These man-made diamonds consist of actual carbon atoms arranged in the characteristic diamond crystal structure. Since they are made of the same material as natural diamonds, they exhibit the same optical and chemical properties. 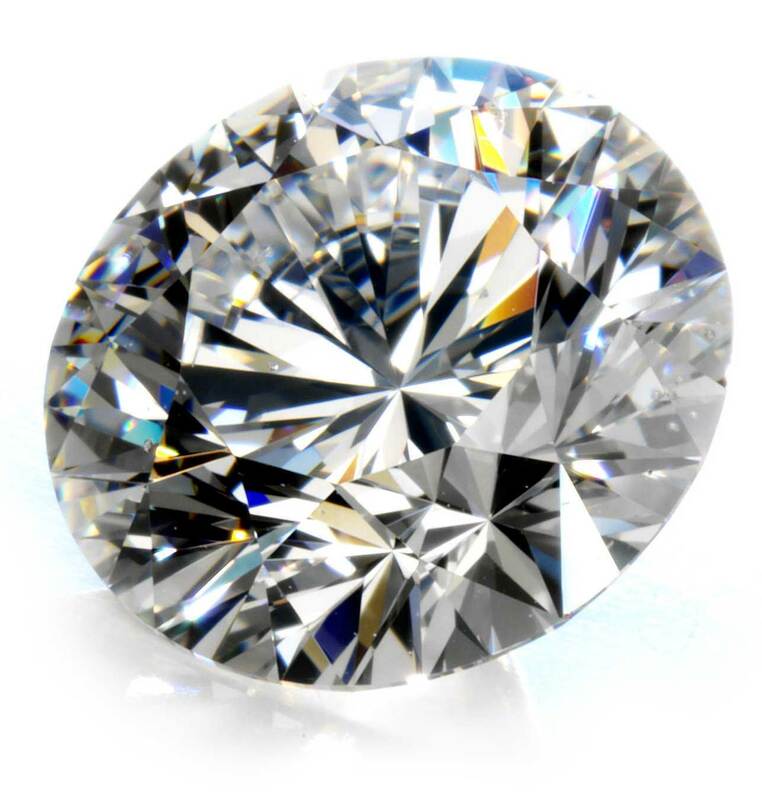 TQ Diamonds’ lab created / man-made diamonds are grown from the tiny carbon seeds of pre-existing diamonds using advanced technology HPHT– high pressure and high temperature - mimics the natural method of diamond formation. TQ Diamonds’ lab grown diamonds are available in a variety of colorless ranges. TQ Diamonds aboveground lab created diamonds are sustainable diamonds; they are ethically grown with minimal environmental impact. TQ Diamonds, "Just Born Diamonds" are lab created diamonds and have the same physical, chemical, and optical properties as mined diamonds. TQ Diamonds, lab grown diamonds offer excellent value, and are more affordable than natural diamonds of comparable size and quality. TQ Diamonds above ground laboratory created diamonds offer excellent value, and are about 30%-40% less than natural diamonds of comparable size and quality. Like the most exotic orchid found in nature, the orchid lovingly grown in the greenhouse is equally rare and beautiful. The same is true for TQ Diamonds above ground diamonds. Similar to a greenhouse, the grown diamond process duplicates what occurs naturally, creating a rare, beautiful and sustainable product. "Just Born Diamond" technology replicates the conditions necessary to grow a diamond crystal above the Earth’s surface. Grown diamonds are produced by utilizing two gem-quality diamond creation processes: High Pressure-High Temperature (HPHT) and Chemical Vapor Deposition (CVD), Green Rocks has perfected the HPHT growth method to deliver high quality color – D, E, F – beautiful white diamonds. In both instances a small diamond seed is placed in a tightly-controlled environment where the rough diamond grows, atom-by-atom, layer-by- layer, recreating the natural process. The HPHT process, crystals are grown as large as 10 carats using 50 kilobars or 725,000 PSI of pressure at 1300 degrees Celsius. If you tried to grow diamond without high pressure, you’d just get graphite. The equipment required is massive: the largest diamond press is three stories tall! It produces about 100 carats at a time in about a week to ten days. Like mined a diamond, there is a lot of variety in color and clarity. Not everything we grow can be cut into a beautiful gem. 2) CVD, or chemical vapor deposition. To grow colorless diamond crystals using the CVD process, methane gas is subjected to high-energy plasma radiation. Methane is CH4: it has one carbon atom and four hydrogen atoms. We use microwave energy heat to break the atomic bonds in the methane and free the carbon to float down and attach to a diamond seed, growing a diamond crystal atom by atom. Diamonds that grow this way can be remarkably pure. When everything goes well, it takes about 10-12 days to produce 140 carats of crystals that are 8-9 carats each. But there are still huge technical challenges that everyone who uses this growth method faces. Growing diamonds is challenging and expensive. What we’re all trying to do is to find language that communicates clearly without confusing you. Unfortunately, there are so many terms for lab grown gems out there (and some bad apples who are actually trying to confuse people) that there isn’t always as much communication as there should be. Cubic zirconia is man-made but it’s an imitation diamond, not a synthetic or lab-grown diamond (because it’s not actually diamond.) Unfortunately, plenty of unscrupulous people use “lab,” “man-made,” or “created” to refer to imitations that are not the actual minerals described. That’s not just bad etiquette, that’s deceptive and clearly against FTC rules. In the end, that’s what this is all about: understanding what the differences are between different kinds of gems so you can make an informed smart choice: mined, lab-grown, man-made, or imitation. It’s up to you! Before we introduced "Just Born Diamonds" to Madison WI, we searched globally to find above ground lab-grown diamonds to match our quality standards. Lab-grown diamonds, just like mined diamonds, may have imperfections (such as inclusions, specks or fissures) however, having absolute quality control and first pick of the best quality polished diamonds means we allow only the highest quality diamonds to make it to your ring. Then each gemstone is expertly cut with precision and skill by Master Cutters. And, we go the extra step to have every "Just Born Diamond" graded by a 3rd party gemological lab and laser inscribed for your protection. This confirms that every TQ Diamonds "Just Born Diamond" is structurally sound and brilliantly beautiful. Controlling the growth process of a TQ Diamonds, "Just Born Diamond" means that you can be 100% assured that its origin is conflict-free. Although traditional diamond mines have gone to great lengths to offset the environmental impact of mining and as an American Gem Society member, TQ Diamonds adheres to the strict guidelines of the Kimberly Process; lab-grown diamonds’ environmental impact is significantly less than that of a mined diamond. If you’re sensitive to how the products you own are produced, as an owner of a lab-grown diamond you can take pride in knowing your diamond had less impact on the Earth. This makes the TQ Diamonds, "Just Born Diamonds" a surprisingly affordable and attractive option to a traditionally mined, natural diamond. Diamond type is a method of scientifically classifying diamonds, both grown and mined, by the level and type of their chemical impurities. Type IIa diamonds make up 1–2% of all mined diamonds. These diamonds are almost or entirely devoid of impurities, and consequently are usually colorless. A colorless Just Born Diamond is classified as type IIa which is considered to be the purest form of diamond known to man. Many large, famous diamonds, such as the Cullinan and Koh-i-Noor, are type IIa. A renowned example is the “Elizabeth Taylor Diamond,” formerly known as the “Krupp Diamond,” a 33.19-carat Type IIa diamond. 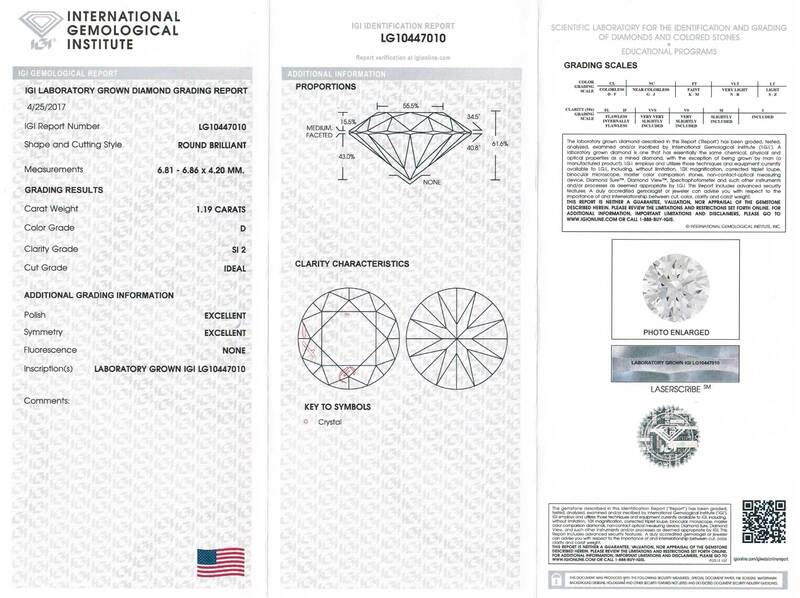 TQ Diamonds, "Just Born Diamonds" are graded to the same specifications as mined diamonds and accompanied by Diamond Grading Reports from leading independent laboratories such as the International Gemological Institute (IGI). These certificates are identical to mined diamond certificates including grading of the 4C’s along with full disclosure of the grown diamond origin. A laboratory grown diamond is man-made but features the same optical and physical properties as a natural diamond including its chemical composition, refractive index and 4C’s. The only difference is its point of origin as one is grown above ground while the other is extracted from the ground. TQ Diamonds saves you time and money by finding you your perfect diamond and we know you want options; we are excited to offer exclusive Lab-Grown "Just Born" Diamonds. "Just Born" diamonds are identical in every way to a diamond mined from the Earth. It exhibits the same exceptional color, clarity, beauty and brilliance as a mined diamond because it is identical in composition to a mined diamond. Yes, identical. Not a simulation. Not a fake. We’re talking molecular level stuff. It’s a diamond – in every way except it was grown not mined. TQ Diamonds "Just Born Diamonds" are a beautiful choice to consider as the centerpiece of your engagement ring. While fancy color lab-grown diamonds may not be new, TQ Diamonds has been researching for nearly a decade to help perfect a sparkling engagement diamond through the lab-grown process. We researched techniques and providers until finding the absolute best source for beautiful, high-scintillation, brilliant lab-grown diamonds suited for your engagement ring - and TQ Diamonds is the first to make them available to our A Jaffe, Tacori, Verragio, Parade and Taryn designer engagement ring clients.